Particularly, when it comes to concealed carry, the Springfield XDS is one of the best subcompact 9mm pistols you can own. However, the weapon can serve for more than self defense, easily. To heighten the already wonderful capabilities of this pistol, we put together a review of the best Springfield XDS lasers for the money. We’ll tell you which was our favorite at the end, as always. Red and green lasers serve for much more purpose than just targeting someone in self defense or tactical operations. Many gunowners use them for hunting, even on their pistols. You can always practice with a laser on a shooting range too. If you own a green laser, having a flashlight work in tandem with it can be one of the ultimate combinations you could make. At the same time, you need to stay wary of going overboard on weight from accessories, especially when you’re dealing with a 3-inch or 4-inch barrel. 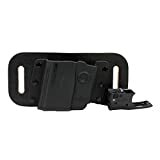 Materials – For your Springfield XDS compact weapon is this universal attachment from Crimson Trace. It’s the least expensive option within this review, and it’s the most compact. It mounts to the accessory rail under the barrel, included on your XDS, and it attaches to the trigger guard in the rear. The ergonomic design requires simple touch activation to turn on. The laser emits a red beam with a Class IIIR <5mw power output. It will automatically shut off after inactivity, to reduce the battery usage. The battery will provide up to four hours of constant on power. The laser can also be adjusted for windage and elevation. Performance – If you want a compact, little laser for your compact pistol, Crimson Trace’s universal option is the way to go. It doesn’t add on to your trigger guard, but it’s still easy to activate with a simple touch. This also makes it significantly lighter than other lasers, and it doesn’t feel like you’ve added anything on to your Springfield XDS. On the other hand, because it’s so small, you need to treat it delicately. It won’t be able to take any impact. The red laser is the most powerful beam that’s allowed for civilian use, and it’s going to be best for nighttime use. If you’ve wanted a laser to assist you in self defense, a red laser is probably your best bet. This is also the most affordable option within this review! What we say – The Crimson Trace universal mount laser is the best Springfield XDS laser for those with self defense in mind and don’t like lasers that install over trigger guards. Plus, you can attach this to any other accessory rails! POWERFUL RED LASER: Features a 5mW peak, 620-670nm, Class 3R visible red laser - the brightest beam allowed by law. INSTANT ACTIVATION: Ambidextrous Tap-On / Tap-Off Controls for immediate laser activation from either side of the unit. Materials – This popular laser is not universal, but it is made for a variety of weapons. Being specifically designed for the Springfield XDS, the Viridian Reactor 5 installs over your weapon’s trigger guard. The ECR instant on technology allows the laser to be automatically turned on and off by drawing or holstering the weapon in the specially designed Viridian holster, which is included. The red laser is a Class IIIR laser product. It can be visible up to a mile away during low light and up to 25 yards away during daylight. The battery life provides up to twelve hours of constant use. A low battery indicator is installed on the laser as well. Performance – Ah, Viridian. There is certainly plenty of convenience that comes with a laser that automatically turns on without you having to touch it. 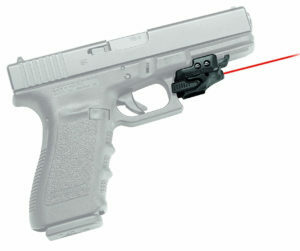 Also with a red laser, this will be a great option for self defense, especially at night. With a little practice, you can have one of the shortest drawing to shooting times, easily. This laser is clearly not for everyone, on the other hand. You have to use Viridian’s ECR instant on holster for this to work, but that is included. So, for a decent price, you’re getting a strong laser and a holster with it. The Viridian Reactor 5 is only a wise choice for select handguns, but the Springfield XDS is one of them. What we say – This is the best Springfield XDS laser for those who want the quickest draw and shooting time possible. Your enemies won’t stand a chance, and you can feel safer too. 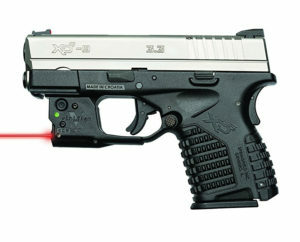 LASER RANGE: The red dot laser is visible up to 1 miles at night and up to 25 yards in daylight. This laser is powered to the maximum legal strength. ECR INSTANT ON: Includes a sleek Instant-On ECR holster that activates the world's most visible red dot laser when drawn. No fumbling with buttons in critical situations. When you draw, it's on! Materials – This Springfield XDS laser is a green laser and flashlight combo. 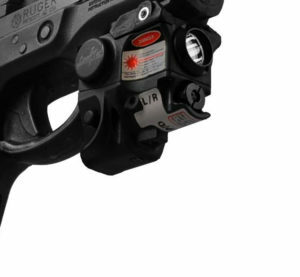 For installation, attach the unit to your pistol’s accessory rail, and clip the rear of the laser to the trigger guard. There is an ambidextrous on and off switch, and the user can toggle between using only the laser, only the flashlight, or both at the same time. The green laser is highly visible during daylight hours. The flashlight can assist in self defense at night. This laser includes two batteries, which are rechargeable. No paying for new batteries when they die out! LaserTac includes a one year warranty to any malfunctions. Performance – This is the only option within this review that includes both a laser and a flashlight. We figured this would be good to include, since the LaserTac choice is a green laser, which is better for day time use. With the flashlight included, you can still utilize this for self defense or tactical purposes, even at night. At the same time, the green laser comes in handy for daytime hunting or practicing in an outdoor range. This option will be heavier. It will be difficult to find an accommodating holster too, so keep that in mind. The batteries are rechargeable, so you save on costs there as well! 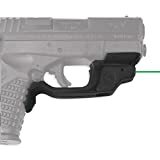 What we say – The LaserTac Laser Sight is the best Springfield XDS laser for, obviously, anyone who wants to include a flashlight in addition to a laser on their pistol. You can get both daytime and nighttime uses out of this accessory! 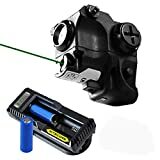 Small size and lightweight green laser sight that specially designed for subcompact handguns and fits all size handguns. Materials – This final option is another Crimson Trace selection, but it’s very different from the first one listed. This U.S.A.-made laser installs onto the accessory rail and over the trigger guard. It emits a green laser beam, which is best for day time use. The laser is a Class IIIA, with the maximum output allowed for civilian use. Windage and elevation can be adjusted. To turn it on, a simple touch activation where you would naturally hold the trigger is all that is needed. Included with the laser accessory are two lithium ion batteries. Performance – Although our second Crimson Trace choice in this review, it holds its own for pros and cons on your Springfield XDS. If you’re too concerned about a delicate laser, like the universal mount, you’ll like this one that is designed to fit over the trigger guard of your pistol. However, you clearly won’t be able to switch it to another pistol, if you ever wanted to. This is the second option with a green laser, as well. It will be light than the LaserTac accessory, since it doesn’t have the flashlight. Of course, that means you’re more limited on purpose. It isn’t entirely ideal for self defense needs, although it is a little visible at night. This is better for range use or hunting. What we say – This is the best Springfield XDS laser for anyone who doesn’t necessarily need one for concealed carry. Crimson Trace is also a great brand in general that will last you a long time. 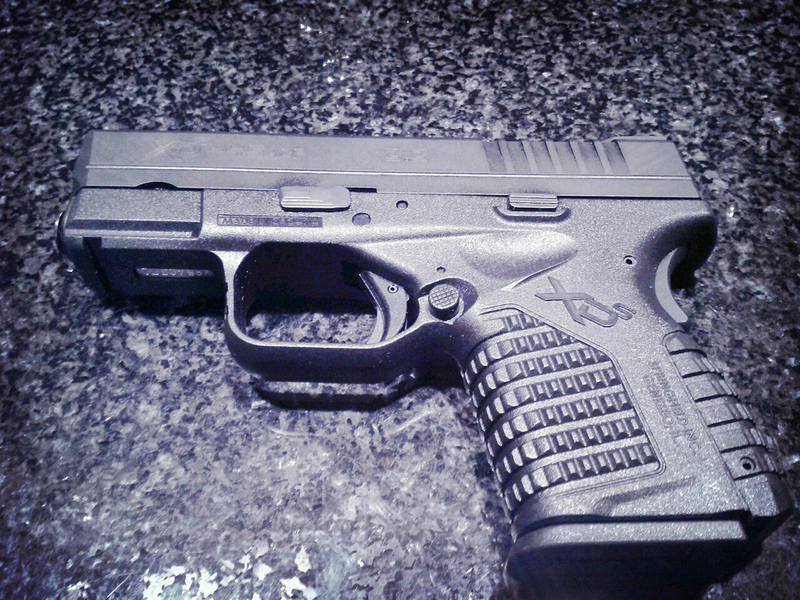 For this review, we chose the first option as our favorite Springfield XDS laser. The Crimson Trace Universal Mount Laser is an ideal size and weight for a compact handgun like the XDS. The brand turns out some high quality products, so just be a little careful when holstering your weapon with the attached accessory. We don’t expect the laser to just fall apart on you. Since it’s so small, as well, you shouldn’t have much difficulty in finding an accommodating holster. Assuming you plan on using your Springfield XDS for some concealed carry, this is the best option. Plus, the red laser beam is powerful and crisp. Especially at night, you can quickly acquire your target and even blind your enemy, if need be. When it comes to lasers in general, the Crimson Trace Universal Mount is one of the most popular picks amongst gunowners, so we don’t think you’ll go wrong here.